The AMC Javelin: A Rarity Indeed. The AMC Javelin was one hot ride. Produced between 1967 and 1974, it was one of AMC’s standout vehicles. Once it had upgrade options like the ‘Go Package’ and either a three for three CU(235hp) or the top 390cu(315hp), it was a force to be reckoned with. Unfortunately, we do not see many on the road today. When you do see one, you would like to think it is one of many out for a cruise or heading to a show. But generally you would be wrong. The bad news is that there are only a few around. Why? Did they all rust out? Have they been crushed or are they sitting in a bone yard somewhere being neglected? Most of the Javelins came with six cylinder engines that were pretty bland cars. A bit odd looking but that seemed the AMC way. Then, they put in a bigger V8 and people noticed the AMC had some possibilities to be stronger. Hence, the AMC began to build the Javelin. That new Javelin had a four barrel carb and a 390 engine. Now, you will get noticed. Just like the sister car the one that was painted red, white, and blue. But this car pictured turned out to be a very fast car with great styling cues. Even though by now there were whispers that this AMX hot rod was on life support from the parent company, AMC kept building as many as possible selling every one they built. The car had issues and as a competitor to the Mopar guys, Mustang lords, and the Chevy dudes, the AMX sort of felt like a step brother. Some did not take the AMX seriously and found out on the street after being smoked to take it seriously from that point forward. The shame of it is that there are not many around at the shows I attend. More than likely there is a AMC car club out there that will discredit everything I say here. I hope so. Because I still see very few of these classic cars and would be delighted if there hundreds out there smokin’ the rear tires and showing these rockets were worthy of being classified as a hot rod. Remember, if you see one to save it. Do the right thing and save it by all means. It will be well worth your time and money. Just look at the car in the picture. 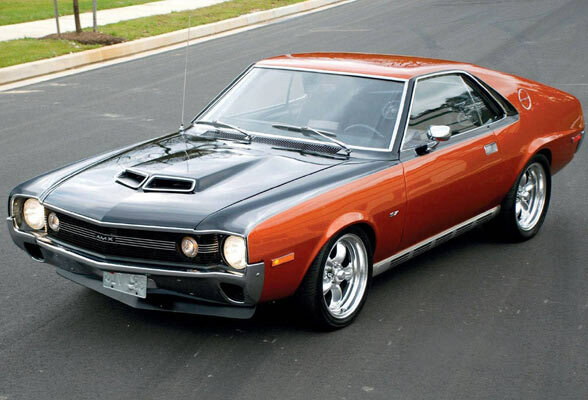 It’s beautiful and right from the showroom floor the AMX was a classic hot rod in the making. Related ItemsThe AMC Javelin: A Rarity Indeed. That”a an AMX, not a Javelin.